Daggett County • Search for 12-year-old will continue Saturday. 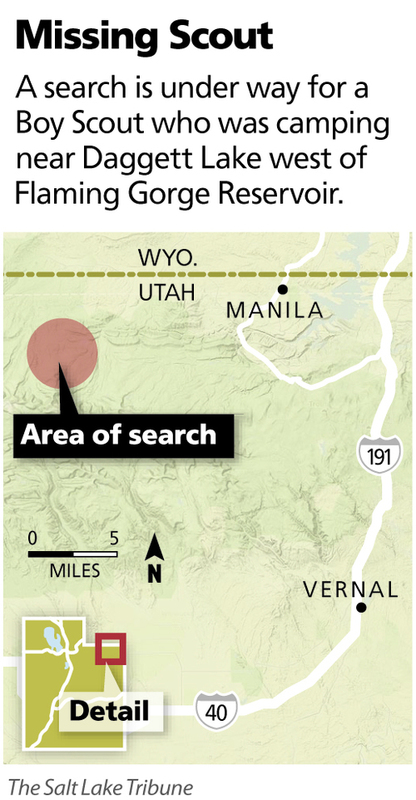 Missing Scout A search is under way for a Boy Scout who was camping near Daggett Lake west of Flaming Gorge Reservoir. A 12-year-old Boy Scout went missing Friday in Ashley National Forest, and search and rescue crews were trying to locate him. Jarrod Ropelato, of Hooper, hiked the Spirit Lake Trailhead with a group of scouts Thursday and camped at Daggett Lake a few miles away. Around noon Friday, the group noticed Ropelato was no longer with them. A text message was sent to the wife of one of the Scout leaders who contacted the Daggett County Sheriff's Office. Sheriff's spokeswoman Karen Peterson said search and rescue crews, deputies and a Department of Public Safety helicopter had been looking for Ropelato since about 1:30 p.m. Friday. Daggett Lake is about 4 miles from the Spirit Lake Trailhead and several miles west of Manila. The search for Ropelato was expected to resume Saturday morning. In addition, The Garrett Bardsley Foundation is asking for volunteers to help in the search. The group will meet at 8:30 a.m. at the Spirit Lake Trailhead. Volunteers may walk or uses horses, but ATVs are not allowed in the area. Bardsley, also a 12-year-old Boy Scout, disappeared in 2004 in the Uinta Mountains. He was never found. His father started the foundation in his name.